#1. This week's number one is an experienced international power forward Jamaal Levy (206-83, college: Wake Forest, currently plays in Argentina). He could not help Weber Bahia (3-4) in their last game. Despite Levy's good performance the third-placed Weber Bahia (3-4) lost 72-76 on the road to the lower-ranked (#4) Quilmes MP in the Group D. He had a double-double by scoring 12 points and getting 10 rebounds. Levy also added 4 blocks in 32 minutes on the court. His team will play only one more game in the Regular Season. And that game will be critical. This year Levy averages: 9.1ppg, 6.1rpg, 1.1apg, 1.3bpg, 2FGP: 61.5%(16-26), 3FGP: 36.0% and FT: 41.7% in seven games he played so far. He is currently a member of the Panamanian senior national team. #2. Second place goes to former international forward Gyno Pomare (203-86, college: San Diego, currently plays in Japan). Pomare was not able to help Shimane Magic (3-3) in their last game on Sunday. Despite his very good performance Shimane Magic (#3) was defeated 97-91 in Ishikawa by the lower-ranked Kanazawa Samuraiz (#4) in the West group. Pomare scored 16 points, had 7 boards, handed out 6 passes and blocked 5 shots. But this is still an early stage of the season and everything may happen. It's Pomare's first year with the team. He has individually a very good season with high stats. Pomare averages: 19.0ppg, 10.2rpg, 5.4apg, 2.8bpg, 2.0spg, 2FGP: 57.9%(44-76) and FT: 58.3%. He is a naturalized American. Pomare played for the Panamanian national team in 2016. He used to play for Fieras de Cocle in Panamanian league. #3. The Panamanian player who performed third best last week abroad was an international center Josimar Ayarza (205-87, college: S.Mississippi, currently plays in Chile). Ayarza was not able to secure a victory for Los Leones (2-1) in their last game. Despite his very good performance Los Leones (#4) was badly defeated 92-74 on the opponent's court by the higher-ranked (#3) Temuco in the Conferencia Centro. Ayarza was the top scorer with 17 points. He also added 5 rebounds and dished 3 assists in 31 minutes. The Regular Season already ended. It's Ayarza's first season with the team. Ayarza has relatively good stats this year: 13.5ppg, 3.5rpg, 2.0apg, 2FGP: 46.2% and FT: 75.0% in two games. Ex-Aguilas de Rio Abajo Panama City player is also a member of the Panamanian senior national team. #4. Forward Akil Mitchell (206-92, college: Virginia, currently plays in France) couldn't help Boulazac Basket (3-2) in their last game. 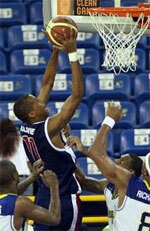 Despite his good performance Boulazac Basket lost 69-74 in Le Mans to the higher-ranked (#3) Le Mans. Mitchell scored 13 points in 34 minutes. But the season is still in it's first stage and everything can happen. This year Mitchell's overall stats are: 8.6ppg, 3.8rpg, 2.6apg and 1.8spg in five games. He is a naturalized American. 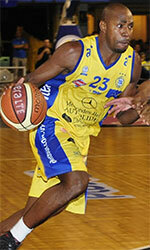 Mitchell is also Panamanian national team player. Strangely he has never played in Panama. #5. International forward Tony Bishop (201-89, college: Texas St., currently plays in Romania) couldn't help Pitesti (1-2) in their game against Sibiu (2-0) in the Romanian Liga Nationala. Bishop scored 8 points, grabbed 6 rebounds and dished 3 assists. Pitesti (#6) was crushed 95-69 on the opponent's court by the leading Sibiu in the Group A. But there are still lots of games to play and it's a long way to go. This season Bishop has relatively solid stats: 12.0ppg, 6.0rpg, 2.5apg and 2.0spg. He plays currently for the Panamanian national team. #6. Forward Pablo Rivas (198-94, college: N.C.Central, currently plays in Spain) couldn't help Vic (0-3) in their game against Moron (1-2) in the Spanish LEB Silver (third division). He scored 8 points and added 3 assists in 25 minutes. Vic (#12) was edged 71-69 in Morón de la Frontera by the higher-ranked (#9) Moron in the East group. So far Vic lost all three games in the Regular Season. This year Rivas' total stats are: 9.0ppg and 3.0rpg in three games. Worth to mention Rivas played also at Eurobasket Summer League, which helped him get the job in pro basketball. He is a former international player as he played for the Panamanian senior team two years ago. #1. Doron Lamb (193-G-91, college: Kentucky, currently plays in Greece) led Lavrio to a victory against the closely-ranked Cretan Kings (0-2) 77-72 in the Greek A1 in Saturday night's game. He scored 11 points. GS Lavrio Aegean Cargo (1-1) is placed tenth in the A1. But the season just started, so everything may happen. This year Lamb has relatively solid stats: 14.0ppg and 1.5rpg. He is a naturalized American. Strangely Lamb has never played in Panama.